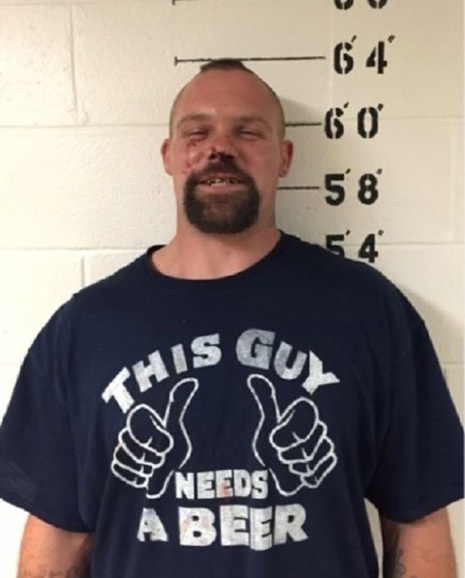 A New Hampshire man wearing a “This Guy Needs A Beer” t-shirt was arrested for drunk driving after crashing his car Friday evening. Joshua Tackett, 29, was nabbed after his Chevy Cruz veered off the road in the town of Kensington (pop. 2124). The auto hit a stone wall, a granite post, and a utility pole before coming to a stop across the street from the Kensington Police Department headquarters. Pictured above, Tackett was arrested for drunk driving and booked into the local jail (from which he was later released on $750 bail). Tackett suffered minor injuries in the crash, but declined medical treatment. He is scheduled to be arraigned Wednesday on the misdemeanor charge.